MR. AND MRS. BRUCE ISMAY LEAVING THE ADRIATIC. Mr. J. Bruce Ismay, the Chairman of the White Star line, who met with such extraordinary treatment at the hands of a large section of the United States Press after he had been saved from the "Titanic" and while he was giving evidence before the American Commission of Inquiry into that disaster, had a most sympathetic reception as he left the liner "Adriatic" at Liverpool on Saturday of last week, in company with his wife. Both were cheered heartily by a large crowd as they walked down the gangway of the vessel. Mr. Ismay asked the newspaper representatives not to press for any statement from him, "First, because he is still suffering from the very great strain of the 'Titanic' disaster and subsequent events; again, because he gave before the American Commission a plain and unvarnished statement of facts, which have been fully reported, and also because his evidence before the British Court of Inquiry should not be anticipated." 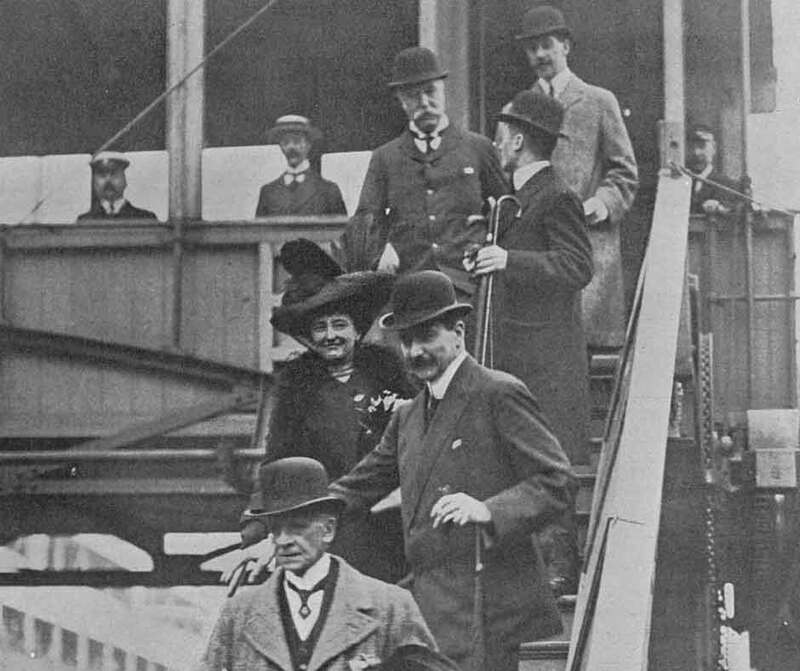 In the foreground of the photograph is Sir John Hare, who has just come back from Canada; behind the famous actor are Mr. and Mrs. Ismay, the former carrying an umbrella.